Remember those chilly mornings when your mom would tear open a packet of instant oatmeal with apples and cinnamon flavoring, pour it into a bowl and add hot water? Or maybe she would stick it in the microwave? The other day, I was craving that warm, apple-cinnamony flavor. It is such a comforting food to eat. However, the version I made tasted much better than those little tear open packets. As you probably know, when oats are stripped down enough to make them “instant,” a lot of texture, not to mention nutritional goodness, is stripped away. So now, I buy steel cut oats or old-fashioned oats. They are good, too. There is something about steel cut oats that I really love; they have sort of a roundness, and when you bite into them, they almost seem to pop in your mouth a little bit. It’s hard to explain. The only problem is they take longer to cook. Old-fashioned oats are much quicker, and still have great texture and more nutritional value. So give them a try! Everything doesn’t have to be super fast, right? Instant food, in general, is nowhere near as good for you. In a small nonstick skillet, melt the butter over medium heat, and then add the apple slices. After a few minutes, the apples will soften and become nice and cinnamony brown in color. 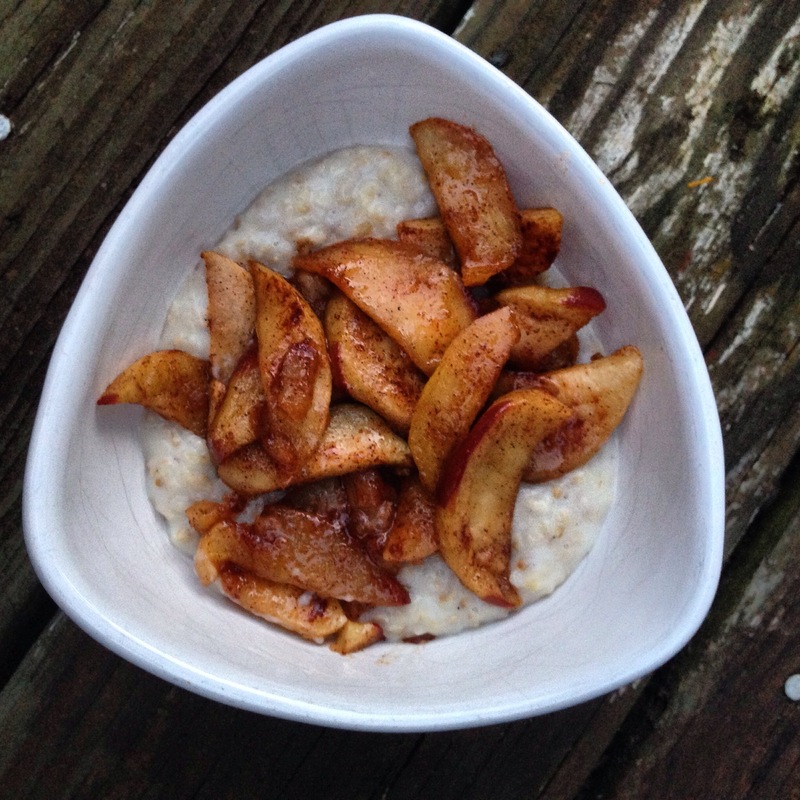 When apples are tender, top a bowlful of the cooked oatmeal with the slices. Looks so, so, so delicious. I would add some peanut or almond butter and cinnamon-spiced yogurt! Looks like the perfect fall breakfast.